I have selected some of the most important developments that have driven product at LOOKCAST. This is a fun record for me and way to gain insight into "how I think." LOOKCAST is the premiere SaaS for creating, sharing, managing and tracking digital lookbooks. This past summer we relaunched our platform, leveraging 2 years of user feedback and insights. A recent challenge was refining how our users shared their lookbooks. The concept of a "lookbook campaign" was something new, proposed by our brilliant and data driven CTO. This addition to our conceptual model would allow for more flexibility in sharing and much better reporting (both things repeated asked for by our customers). However, like any major new feature/process it was less developed and needed to be refined. A core principle (even with LC1.0) has always been to enable users to share one lookbook in different ways. Why is this important? It takes time to create a lookbook and most users want to take one lookbook and share it with both their B2B and B2C network. Of course you don't want to share wholesale pricing with just anyone, so have the ability to "protect" your lookbook was important. Through this concept of campaigns a user can share a lookbook publicly on social media and also share a password protected version with wholesale pricing. Instead of having to create two different lookbooks, a user can create many different campaigns using the same lookbook as the starting point. A startup always has to balance between shipping and perfecting. We like to think of our development cycle as a train schedule. Every month we push at least one big feature. This train schedule forces us to recognize what can fit in 1 month vs. 2, and it also encourages us to build, measure, learn and repeat. This is the way I think good products are made, thinking can only take you so far. The web and it's corner cases will always be there to educate you and highlight all the things you did not consider! In our first iteration of sharing via campaigns we wanted to "educate" or hint at all the different ways a user could share a lookbook. We spent a lot of time building a flexible system that users could tailor to meet a variety of business needs. So when a user took the action to share their lookbook we proudly presented a popup with prepackaged "campaign styles". Instead of being a cool moment of discovery this popup became a point of stress for users who didn't know how they wanted to share. More importantly, there was no way for them in that moment to truly understand what each of our campaign styles did. We assumed users would just test and try things as they ultimately are the ones to take the action of sharing their campaign link. We knew something was wrong when our in-trial metrics showed a disproportionate amount of lookbooks being created vs shared. When users did try sharing they always clicked on the custom campaign option (a sign that they weren't comfortable making a choice). Additionally we felt there were too many steps between creating a campaign and pushing the campaign live. Early prototype of sharing using prepackaged "campaign styles"
I knew that we needed to clarify what these campaign styles meant, and what aspects of the lookbook they controlled. A wizard would help users understand the "steps" they would need to take before having a url they could share. Trying to squeeze everything into a multistep wizard was not working, above is an example of one of the quick iterations we tried (notice the amount of layers in the file!). I also used Invision to make quick interactive prototypes. In the end it was clear that our initial desire to educate users via Campaign Styles was flawed. Yes our app does some pretty amazing things, but we needed to readjust our thinking to align with what our customers wanted to do vs. what we wanted to show them. I deleted the Campaign Styles feature from the app in favor of two primary ways of sharing: quick or customized. Presently, users can click one button to share their lookbook or they can create a tailored experience using our campaign editor. With Quick Sharing we set some smart defaults to prevent users from accidentally sharing their wholesale pricing on FaceBook. 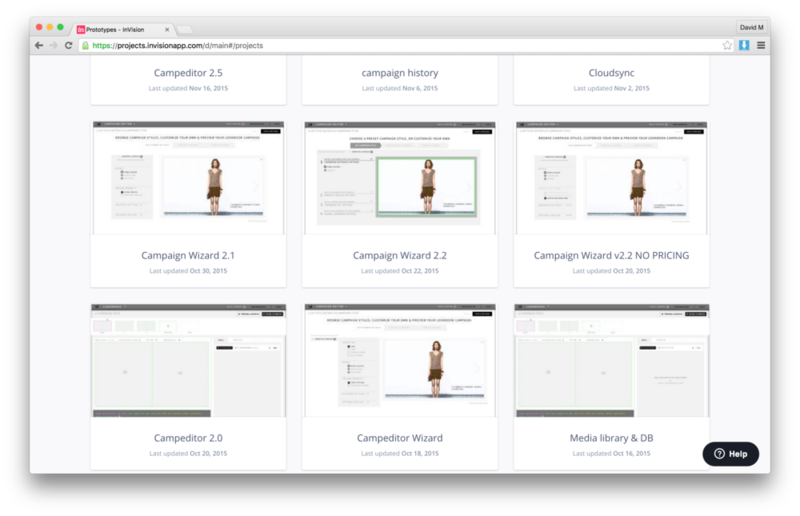 The campaign editor was further refined by showing users (WYSIWYG) exactly what they were changing in their lookbook. So to the right of the four main options we placed an iframe of the actual lookbook. When a user toggles a value we show what content is hidden or revealed. The brief video at the end of the post should help illustrate things in more detail.